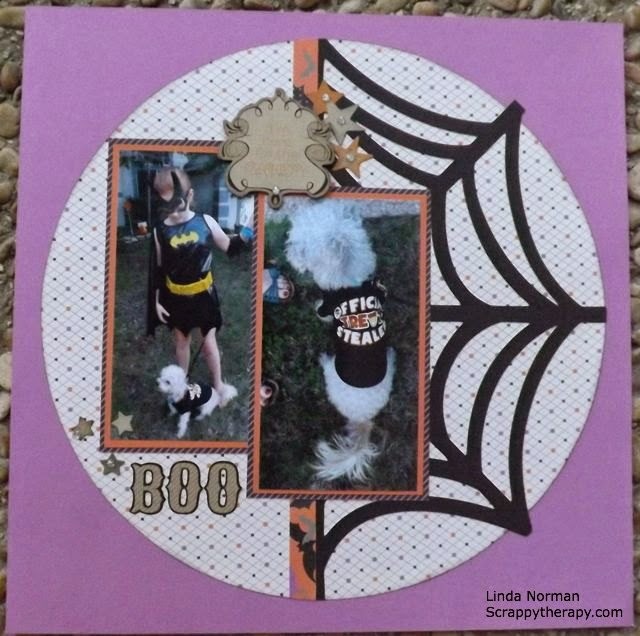 Scrappy Therapy: Scaredy Cat Dog? My kids begged for this outfit for the dog. So of course I had to take pictures! 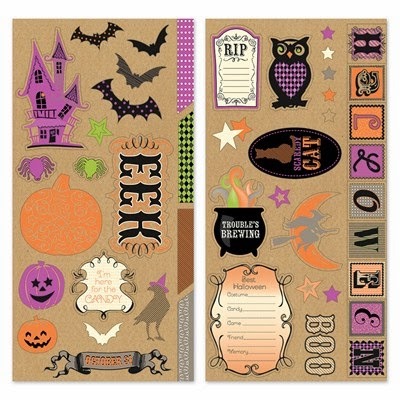 The leftovers of paper from the Scaredy Cat Layout Class were perfect to make this page! I used Thistle card stock for the background! The spider web cut with the Artbooking Cricut cartridge was left from the workshop as were the Complements Boo, stars and sentiment (I want Candy!). I cut the biggest circle with the Art Philosophy Cricut Cartridge possible in the dot/argyle paper from Scaredy Cat and divided it in half with a zip strip with bats on it. Trimmed my photos to 3 x 5 to make more of the spiderweb visible and matted them in the stripe and the Sunset! I also added a few bling, our Sparkles, because everything is better with bling! or is that bacon? Hmmm, I think both! little red wagon has a challenge right now to do something Halloween, spooky, not much of a fan of spooky but it is definitely Halloween. 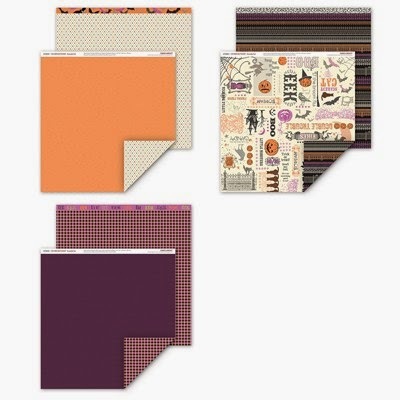 Scrap & Play Challenge #12 was to create something spooky too! Love your spider web! Cute page! Thanks for joining us at Scrap & Play! Love the design! The half web is super. An all around great layout. Thanks for joining us at Scrap & Play! love the fun spider web!!!! Thanks for joining us at Scrap & Play!